Mumbai, India, 11 February 2013 – At the India national finale of the CFA Institute Research Challenge held in Mumbai, Narsee Monjee Institute of Management Studies, Mumbai (NMIMS Mumbai) and Indian Institute of Foreign Trade, Delhi (IIFT Delhi) emerged as winners to represent the country in the Asia Pacific regional final of CFA Institute Research Challenge. More than 40 leading business schools participated in this year's Indian rounds (www.iaipirc.org). CFA Institute, the global association of investment professionals worldwide, and its member society Indian Association of Investment Professionals (IAIP) hosted the local rounds of the competition in India. This is part of an annual, global educational initiative to promote the best practices in equity research amongst the next generation of analysts. The India competitions were supported by National Stock Exchange (NSE) (www.nseindia.com), Bloomberg (www.bloomberg.in), Bloomberg TV (www.bloombergtv.com, www.yourmoneysite.com) and Corporate Bridge (www.educorporatebridge.com) as sponsors and long-term corporate partners. 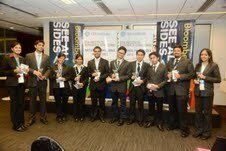 The zonal competitions over the past six months culminated in the National finale hosted by Bloomberg at their office. Five zonal teams from the West, South, North, Central and East zones emerged as local winners after grueling competitions amongst more than 40 leading business schools of the country. The teams presented their research reports and equity recommendations on HDFC Bank, Infosys, Cairn India, Cadila Healthcare, and McLeod Russell to a distinguished panel of judges at the India national finale. NMIMS Mumbai and IIFT Delhi won the national finale, and are representing India at the Asia Pacific regional final during February 22-23 in Kuala Lumpur. The panel comprised of Mr. Bharat Shah, Executive Director, ASK Investment Holdings; Mr. Prasun Gajri, CFA, Chief Investment Officer, HDFC Life; Mr. Nirmal Jain, Founder and Chairman, India Infoline; and Mr. Saurabh Mukherjea, CFA, Head of Equities, Ambit Capital. In addition, the India national finale was followed by an enlightening panel discussion on the topic “Outlook for Indian Equity Markets – 2013” amongst the esteemed investment management practitioners. The CFA Institute Research Challenge aims to provide university students with an unparalleled experience of working with investment industry professionals and publicly traded companies to produce an equity research report, as well as to promote the best practices in research among the next generation of analysts. Each participating team was mentored by an experienced practitioner or a CFA charterholder. All participants were introduced and held to the CFA Institute Code of Ethics and Standards of Professional Conduct. Each university was represented by a team of students who undertook review of a public company comprising of detailed interactions with senior executives at companies, investment thesis and risks analysis, financial modeling, valuation, comparable benchmarking, scenario creation and writing a detailed equity research report and presentation around all these aspects.